Though we rely on our feet to carry us just about everywhere we go in life, we also tend to take them for granted, only noticing them once they're feeling sore or swollen. When our feet hurt, then it slows down the whole system. You might just be surprised how refreshing a little foot pampering can be! Treat your tired soles to our NEW, warming, gently exfoliating organic cornmeal foot scrub to smooth calluses and soften the rough skin of the feet. With its warming, stimulating spices, this scrub not only smells scrumptious, but also helps to increase blood flow to cold, tired feet. Certified Organic Clove and Cinnamon are naturally antibacterial, while Ginger Root and Mustard stimulate, warm and soothe. Along with conditioning Certified Organic Shea Butter and Avocado Oil, this mild scrub fosters softer, nourished, healthier skin with essential fatty acids and Vitamin E.
Use as daily maintenance between pedicures. 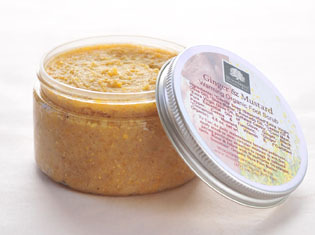 To give yourself (or someone special) a full spa pedicure, begin with one of our fabulous effervescent Spa Foot Soaks, follow with our Ginger & Mustard Foot Scrub, then finish off with a tingling foot and leg massage using our Ginger & Mustard Organic Shea foot butter.